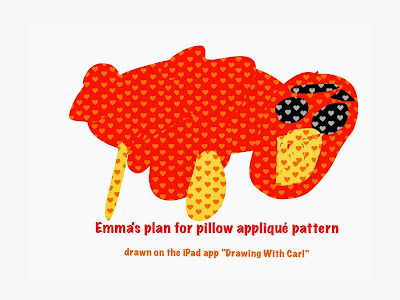 Emma is a young adult artist on the autism spectrum. She has a strong sense of fashion, and her visual art style is bold using shapes and blocks of colour. Because of her love of fashion, we thought that sewing was a skill she would enjoy that could open up opportunities in the world of work. Because of her own personal art style, we decided to start our sewing lessons with applique projects. Our first project (introducing the use of a sewing machine) was a pocket for an apron (Emma also loves cooking, and is quite independent and happy working in the kitchen). Step 1: Design the applique. 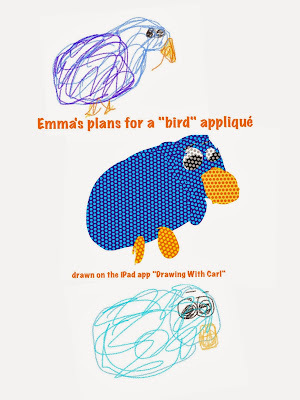 Emma drew these design ideas using the iPad app "Drawing with Carl". Step 2: Under Emma's direction (and following the bird pattern she had drawn), we cut out pieces of coloured material to sew onto the pocket (she selected the material & told me what shape to cut, I handled the very sharp sewing scissors for this initial session). Step 3: Then we ran the sewing machine together: I threaded the machine, Emma chose the stitch pattern, then Emma ran the peddle (controlling on/off and speed) and I fed/steered the material past the needle. It was a little exciting in spots because we didn't sew slow! But we ended up with a bright bird on the apron pocket (and neither one of us sewn into the design!). 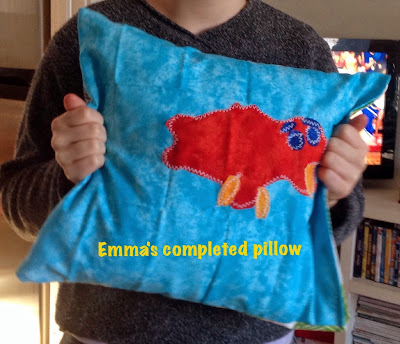 Emma really enjoyed the sewing and was very pleased with having her design turn into something she could wear. 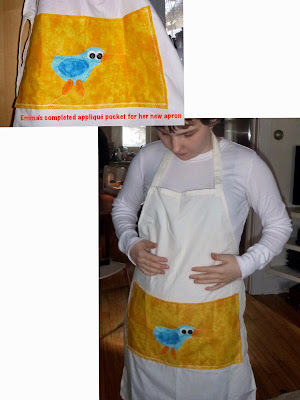 (for this first project, I sewed up a simple apron design ahead of time, and Emma sewed the pocket onto the apron so we could have a completed project in a shorter time-frame). Our second project was a throw pillow. Step 2: I cut out the fabric pieces for the design under Emma's very definite verbal directions (great context for language use, she was highly motivated to tell me exactly what she wanted me to do, and also not shy to tell me when I had done it wrong and it needed to be redone - she has always been a woman who knows her own mind, something I really like about her). Step 3: Emma approached the sewing with more confidence the second time around, and experimented with various types of applique stitches and with the speed control on the machine. Once again I steered the material while she ran everything else (important to go step-wise when working close to sharp objects, like the mechanized needle on a sewing machine). I love Emma's bold bright design sense. We plan to continue our sewing lessons, and our next project will likely be shoulder/carry bags that can be used for books or iPads or shopping. Stay tuned for updates!